When I mentioned that our car is out of action and our local postmen usually pick up our out-going packages as well as delivering the post, a Bookmooch friend was reminded of the local rural postmen where she grew up. So this journal was born, a result of my wondering if we were unique in the UK in having house-to-house deliveries (we are not) and how mail and post arrives in other places. 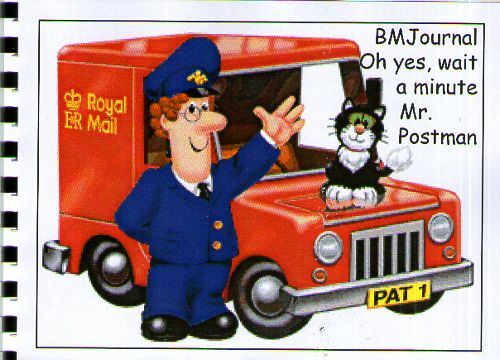 This journal is the place to talk about the postal arrangements in your locality, to tell stories about post or to draw the wonderful logos, illustrate the origins of mail services, whatever appeals to you. Please do not alter anyone else’s work. Relist by the number (string of letters & one number in red!) opposite within two weeks of receiving the journal and only send on Bookmooch and to friends of the bmjl – the big pale blue world logo should appear in their friends list. If your requester is not a friend ask them to apply to be before accepting a request. Only persistent defaulters will be barred from journalling to protect journals which remain the property of their creators and to enhance the enjoyment of journalling for others. Thank you! Diolch yn fawr iawn, and enjoy your journalling! To see the slideshow please click on the underlined blue link in the journal description above.